After about 60 years of absence the word ‘Skiffle’ has suddenly made a reappearance in the news leaving a number of people, particularly younger ones, scratching their heads and wondering “Huh?” Surprising as it might seem there are actually some people out there - intelligent people with O levels, Tufty Club badges and a full set of Pokémon trading cards who do not know what skiffle is - and why it might be of interest to the population of St Margarets… so here is a crash course. 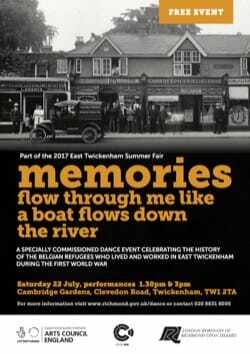 A specially commissioned dance event celebrating the history of the Belgian Refugees who lived and worked in East Twickenham during the First World War. Night flights from Heathrow will continue unless the airport is expanded, the Government has confirmed. A move that Richmond and Wandsworth councils argue is a serious gamble with the health of Londoners. Come over to Moormead Park for the Fair. The fair runs from 11.45am to 7:30pm. There are loads of stalls, food, drink, music, the annual 5-a-side football competition and an amazing dog show. 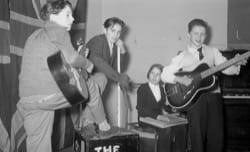 Do you have any old photographs, memorabilia or documents relating to Marble Hill Park? Bring them along to our collection event. We’ll take photographs of your contributions and record the story behind them before handing them straight back to you. In this way we hope to build up a social history of the park since the early 1900s, when it came into public use. Join us for a month of workshops inspired by our new Stables Gallery exhibition Picture Play. Explore themes of Animation, Toys and Games and the exciting stories and characters of Orleans House.